Byrdy Galernik dribbles the ball. The sophomore guard and the Wildcats won at UT-Martin on Saturday. It wasn’t supposed to go like this. Last year, Northwestern cruised to an 82-59 win over Tennessee-Martin. This year, the Wildcats and Skyhawks were knotted at 50 with just over nine minutes remaining. 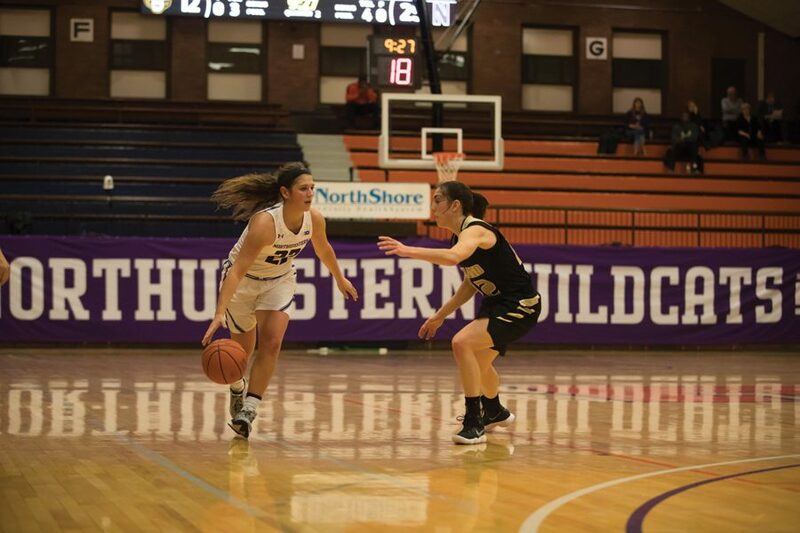 Then senior guard Lydia Rohde drilled a 3-pointer, freshman guard Jordan Hamilton splashed another and NU (3-0) pulled out to a 6-point lead it didn’t relinquish, eventually closing out a 71-63 victory Saturday. Rohde made the most of those opportunities, pouring in a career-high 22 points on 7-of-11 shooting. The senior did most of her damage from behind the arc, shooting 6-of-10 from deep. She wasn’t the only setting career-highs on the day, as sophomore forward Abi Scheid added 21 points, her own personal best. Scheid shot 9-of-13 in the game and pulled down eight rebounds. Hamilton played a crucial role in that success, dishing out seven assists and handling point guard duties for much of the game. She played 38 minutes, while backup sophomore guard Byrdy Galernik played 12 across multiple positions. At times, however, the freshman looked shaky, committing a team-high five turnovers including three under pressure in the fourth quarter. After building a 63-53 lead with just over three minutes to go, NU committed four turnovers in the next two minutes, and UT-Martin cut the lead to 67-63 with just over 30 seconds remaining. Clutch free throws from Hamilton and fellow freshman guard Lindsey Pulliam helped seal the Cats’ victory. Despite that poise, the team is still struggling with turnovers. Against relatively weak competition, NU is committing 20.3 turnovers per game. Following the departure of four seniors, that number is up almost six per game from last season. The two freshman guards, each starting and playing more than 30 minutes per game, have been the biggest culprits so far, combining for 23 of the team’s 61 turnovers. Even so, the Cats still sit at 3-0 headed into a difficult stretch in which they play four games in five days.